adagioAcrobatic act, generally involving a man and a woman, presented in a slow or romantic mood. Acrobatic act, generally involving a man and a woman, presented in a slow or romantic mood. aerialistAny acrobat working above the ring on an aerial equipment such as trapeze, Roman Rings, Spanish web, etc. Any acrobat working above the ring on an aerial equipment such as trapeze, Roman Rings, Spanish web, etc. aerial strapsPair of fabric or leather straps used as an apparatus for an aerial strap act. Pair of fabric(See: Tissu) or leather straps used as an apparatus for an aerial strap actAerial act performed hanging from a pair of fabric or leather straps. See Aerial Straps..
antipodist(French: Antipodiste, Russian: Antipod) Foot juggler. (French: Antipodiste, Russian: Antipod) Foot juggler. attraction(Russian) A circus act that can occupy up to the entire second half of a circus performance. (Russian) A circus act that can occupy up to the entire second half of a circus performance. augusteIn a classic European clown team, the comic, red-nosed character, as opposed to the elegant, whiteface Clown. In a classic European clown team, the comic, red-nosed character, as opposed to the elegant, whiteface Clown. balagan(Russian) A fairground booth or theater. (Russian) A fairground booth or theater. balagans(Russian) Fairground booths or theaters. (Russian) Fairground booths or theaters. ballerina on HorsebackAcrobatic and dance figures performed by an equestrienne, often wearing a tutu, standing on the back of a horse. Acrobatic and dance figures performed by an equestrienneA female equestrian, or horse trainer, horse presenter, or acrobat on horseback., often wearing a tutu, standing on the back of a horse. bambou(French - Russian: Bambuk) Aerial apparatus, generally a hanging perch, from where the performers hang with the help of hand or ankle loops. See also: Aerial perch. (French - Russian: Bambuk) Aerial apparatus, generally a hanging perch, from where the performers hang with the help of hand or ankle loops. See also: Aerial perch. banquette(French. U.S.: Ring Curb. Russian: Barrier) The circular barrier that defines the ring&mdash;so called because it is traditionally large enough for someone to sit on it. (French. U.S.: Ring Curb. Russian: Barrier) The circular barrier(Russian. French: Banquette. U.S.: Ring Curb) The circular barrier that defines the ring, and separates it from the audience. that defines the ring—so called because it is traditionally large enough for someone to sit on it. banquine(French) Acrobatic presentation in which an acrobat performs various acrobatic jumps propelled from a living platform made by the crossed hands of two other acrobats (as in "sauts de banquine" &mdash; See also: Basket Acrobatics). (French) Acrobatic presentation in which an acrobat performs various acrobatic jumps propelled from a living platform made by the crossed hands of two other acrobats (as in "sauts de banquine(French) Acrobatic presentation in which an acrobat performs various acrobatic jumps propelled from a living platform made by the crossed hands of two other acrobats (as in "sauts de banquine" &mdash; See also: Basket Acrobatics)." — See also: Basket Acrobatics). barrel-jumpingAct in which an acrobat jumps from inside a barrel to inside another barrel, often placed at different levels. Act in which an acrobat jumps from inside a barrel to inside another barrel, often placed at different levels. barrier(Russian. French: Banquette. U.S.: Ring Curb) The circular barrier that defines the ring, and separates it from the audience. (Russian. French: Banquette. U.S.: Ring Curb) The circular barrier(Russian. French: Banquette. U.S.: Ring Curb) The circular barrier that defines the ring, and separates it from the audience. that defines the ring, and separates it from the audience. barrière(French) The line of uniformed artists and assistants who, in the old equestrian circus, stood at attention at the ring entrance to assist their fellow performers if needed. When seen today, the Barrière is usually made of the Ring Crew. (French) The line of uniformed artists and assistants who, in the old equestrian circus, stood at attention at the ring entrance to assist their fellow performers if needed. When seen today, the Barrière is usually made of the Ring Crew. bar-to-barA flying trapeze act in which flyers leap from a trapeze to another, instead of from a trapeze to a catcher as is most commonly seen today. A flying trapezeAerial act in which an acrobat is propelled from a trapeze to a catcher, or to another trapeze. (See also: Short-distance Flying Trapeze) act in which flyers leap from a trapeze to another, instead of from a trapeze to a catcherIn an acrobatic or a flying act, the person whose role is to catch acrobats that have been propelled in the air. as is most commonly seen today. batoude(French) A long wooden tramplin that acrobats use to jump over other performers, horses, or elephants, notably in the charivari. Also called "grande batoude". (French) A long wooden tramplin that acrobats use to jump over other performers, horses, or elephants, notably in the charivari(Italian, French) A joyous acrobatic display, mostly tumbling, originally performed by all the clowns of a circus company as a show opener. (Clowns, until the turn of the twentieth century, were generally gifted tumblers; tumbling was considered an "eccentric," or comedic circus specialty.). Also called "grande batoude(French) A long wooden tramplin that acrobats use to jump over other performers, horses, or elephants, notably in the charivari. Also called "grande batoude".". benefitSpecial performance whose entire profit went to a performer; the number of benefits a performer was offered (usually one, but sometimes more for a star performer during a long engagement) was stipulated in his contract. Benefits disappeared in the early twentieth century. Special performance whose entire profit went to a performer; the number of benefits a performer was offered (usually one, but sometimes more for a star performer during a long engagement) was stipulated in his contract. Benefits disappeared in the early twentieth century. bolleadoraA traditional Gaucho weapon made of two weights attached at both ends of a cord, used by Argentinean Bolleadora Dancers. A traditional Gaucho weapon made of two weights attached at both ends of a cord, used by Argentinean Bolleadora Dancers. boss canvasman(U.S.) In the traditional American circus, the person in charge of setting up and putting down the tents. Modern usage: Tentmaster. (U.S.) In the traditional American circus, the person in charge of setting up and putting down the tents. Modern usage: Tentmaster. bouncing ropeAn rope placed between two supports or pedestals, and fastened at one or both ends to a spring or bungee, so that the ropedancer can use the rope as a propelling device. An rope placed between two supports or pedestals, and fastened at one or both ends to a spring or bungee, so that the ropedancer can use the rope as a propelling device. bowl pagodaA Chinese hand balancing and contortion act, in which the performer maintains piles of bowls on her/his head, feet, and/or free hand. The same is also performed with pyramids of glasses on trays, and is known as "Glass Pagoda". A Chinese hand balancing and contortion act, in which the performer maintains piles of bowls on her/his head, feet, and/or free hand. The same is also performed with pyramids of glasses on trays, and is known as "Glass Pagoda". candy butcher(American) Concession vendor; so named because one of the first successful concessionaires of the American circus was a former butcher. (American) Concession vendor; so named because one of the first successful concessionaires of the American circus was a former butcher. cage act(English/American) Act performed in a cage, such as lion or tiger acts. (English/American) Act performed in a cage, such as lion or tiger acts. carpet clown(English) An Auguste performing short pieces between the acts during prop changes or equipment rigging. See also: Reprise Auguste. (English) An Auguste performing short pieces between the acts during prop changes or equipment rigging. See also: Reprise Auguste. carrouselA choreographed equestrian ensemble display, very popular in European court entertainments of the 17th and 18th centuries. A choreographed equestrian ensemble display, very popular in European court entertainments of the 17th and 18th centuries. casse-cou(French) A front, or forward, somersault. (French) A front, or forward, somersault. catcherIn an acrobatic or a flying act, the person whose role is to catch acrobats that have been propelled in the air. In an acrobatic or a flying actAny aerial act in which an acrobat is propelled in the air from one point to another., the person whose role is to catch acrobats that have been propelled in the air. cat trainer(English/American) An trainer or presenter of wild cats such as tigers, lions, leopards, etc. (English/American) An trainer or presenter of wild cats such as tigers, lions, leopards, etc. chambrière(French) Long whip customarily used by Equestrians for the presentation of horses "at liberty." (French) Long whip customarily used by Equestrians for the presentation of horses "at liberty"Liberty act", "Horses at liberty": Unmounted horses presented from the center of the ring by an equestrian directing his charges with his voice, body movements, and signals from a ''chambrière'' (French), or long whip.."
chapiteau(French, Russian) A circus tent, or Big Top. (French, Russian) A circus tent, or Big Top. cigar boxA juggling prop in the form of a cigar box, which was originally made of actual cigar boxes. A juggling prop in the form of a cigar boxA juggling prop in the form of a cigar box, which was originally made of actual cigar boxes., which was originally made of actual cigar boxes. cloud swing(English, American) The ancestor of the trapeze: a slack rope hanging from both ends, used as an aerial swinging apparatus. The addition of a bar in the middle led to the creation of the trapeze. (English, American) The ancestor of the trapeze: a slack rope hanging from both ends, used as an aerial swinging apparatus. The addition of a bar in the middle led to the creation of the trapeze. clown alley(American) In an American circus, the clowns' dressing room (or tent), and by extension, the clown ensemble of a circus. (American) In an American circus, the clowns' dressing room (or tent), and by extension, the clown ensemble of a circus. clownGeneric term for all clowns and augustes. '''Specific:''' In Europe, the elegant, whiteface character who plays the role of the straight man to the Auguste in a clown team. Generic term for all clowns and augustes. Specific: In Europe, the elegant, whiteface character who plays the role of the straight man to the Auguste in a clown team. construction(French) A temporary circus building, originally made of wood and canvas, and later, of steel elements supporting a canvas top and wooden wall. Also known as a "semi-construction." (French) A temporary circus building, originally made of wood and canvas, and later, of steel elements supporting a canvas top and wooden wall. Also known as a "semi-construction(French) A temporary circus building, originally made of wood and canvas, and later, of steel elements supporting a canvas top and wooden wall. Also known as a "semi-construction."." corde lisse(French) A vertical rope used in aerial acts, either for the act itself, or to climb up to an apparatus. Called Spanish Web when covered with fabric. (French) A vertical rope used in aerial acts, either for the act itself, or to climb up to an apparatus. Called Spanish Web when covered with fabric(See: Tissu). djiguit(Russian &mdash; Also: Dzhigit). A skilled horseman from the Caucasus; by extension, a trick rider (sometimes called a Cossack). (Russian) A skilled horseman from the Caucasus; by extension, a trickAny specific exercise in a circus act. rider (sometimes called a Cossack). donut(U.S.) A small, circular cushion, in the form of a doughnut, used for head-balancing tricks, notably for head-to-head balancing. (U.S.) A small, circular cushion, in the form of a doughnut, used for head-balancing tricks, notably for head-to-head balancing. double-doubleA double somersault combined with a full double twist. A double somersault combined with a full double twist. entrée(French) Clown piece with a dramatic structure, generally in the form of a short story or scene. (French) Clown piece with a dramatic structure, generally in the form of a short story or scene. equestrienneA female equestrian, or horse trainer, horse presenter, or acrobat on horseback. A female equestrian, or horse trainer, horse presenter, or acrobat on horseback. en douceur(French) In a cage act, the presentation of big cats in a mutual confidence mode, stressing their natural abilities &mdash; as opposed to ''en férocité''. (French) In a cage act(English/American) Act performed in a cage, such as lion or tiger acts., the presentation of big cats in a mutual confidence mode, stressing their natural abilities — as opposed to en férocité(French) In a cage act, the presentation of big cats in a confrontational mode, stressing their dangerous nature &mdash; as opposed to ''en douceur''..
en férocité(French) In a cage act, the presentation of big cats in a confrontational mode, stressing their dangerous nature &mdash; as opposed to ''en douceur''. (French) In a cage act(English/American) Act performed in a cage, such as lion or tiger acts., the presentation of big cats in a confrontational mode, stressing their dangerous nature — as opposed to en douceur(French) In a cage act, the presentation of big cats in a mutual confidence mode, stressing their natural abilities &mdash; as opposed to ''en férocité''..
flashIn juggling, to flash is the act of juggling objects in a move that is sustained for only a very short time. In juggling, to flashIn juggling, to flash is the act of juggling objects in a move that is sustained for only a very short time. is the act of juggling objects in a move that is sustained for only a very short time. flip-flapA frequent misspelling of "flic-flac" (back handspring). A frequent misspelling of "flic-flacA back handspring. (See also: Flip-flap)" (back handspring). flashingIn juggling, the act of juggling objects in a move that is sustained for only a very short time. In juggling, the act of juggling objects in a move that is sustained for only a very short time. fly-barOn a flying trapeze rig, the swinging trapeze used by the flyer (as opposed to the trapeze used by the catcher). On a flying trapezeAerial act in which an acrobat is propelled from a trapeze to a catcher, or to another trapeze. (See also: Short-distance Flying Trapeze) rig(American) The rigged apparatus used to perform an aerial act, especially a flying act., the swinging trapeze used by the flyerAn acrobat that is propelled in the air, either in a flying act, or in an acrobatic act (i.e. teeterboard). (as opposed to the trapeze used by the catcherIn an acrobatic or a flying act, the person whose role is to catch acrobats that have been propelled in the air.). flyerAn acrobat that is propelled in the air, either in a flying act, or in an acrobatic act (i.e. teeterboard). An acrobat that is propelled in the air, either in a flying actAny aerial act in which an acrobat is propelled in the air from one point to another., or in an acrobatic act (i.e. teeterboardA seesaw made of wood, or fiberglass poles tied together, which is used to propel acrobats in the air.). flying actAny aerial act in which an acrobat is propelled in the air from one point to another. Any aerial act in which an acrobat is propelled in the air from one point to another. free ladderUnsupported vertical ladder on which acrobats perform balancing and/or juggling tricks. Unsupported vertical ladder on which acrobats perform balancing and/or juggling tricks. front benderA contortionist who displays a front flexibility (as opposed to a back flexibility). A contortionist who displays a front flexibility (as opposed to a back flexibility). glass pagodaA Chinese hand balancing and contortion act, in which the performer maintains pyramids of glasses on trays on her/his head, feet, and/or free hand. The same is also performed with piles of bowls, and is known as "Bowl Pagoda". A Chinese hand balancing and contortion act, in which the performer maintains pyramids of glasses on trays on her/his head, feet, and/or free hand. The same is also performed with piles of bowls, and is known as "Bowl Pagoda". hand-to-handAn acrobatic act in which one or more acrobats do hand-balancing in the hands of an under-stander. An acrobatic act in which one or more acrobats do hand-balancing in the hands of an under-standerIn an acrobatic act, the person who is at the base, supporting other acrobats (for example, the base of a human pyramid). Also known as the "bottom Man" (or "Bottom Woman")..
heel catchIn a trapeze act, a dive frontward or backward, caught to the trapeze bar by the heels. In a trapeze act, a dive frontward or backward, caught to the trapeze bar by the heels. high wireA tight, heavy metallic cable placed high above the ground, on which wire walkers do crossings and various acrobatic exercises. Not to be confused with a tight wire. A tight, heavy metallic cable placed high above the ground, on which wire walkers do crossings and various acrobatic exercises. Not to be confused with a tight wireA tight, light metallic cable, placed between two platforms not very far from the ground, on which a wire dancer perform dance steps, and acrobatic exercises such as somersaults. (Also: Low Wire). hippodramaEquestrian pantomime, often with a military subject matter, very popular in mid-nineteenth-century urban circuses. Equestrian pantomimeA circus play, not necessarily mute, with a dramatic story-line (a regular feature in 18th and 19th century circus performances)., often with a military subject matter, very popular in mid-nineteenth-century urban circuses. hoop divingA Chinese acrobatic specialty involving acrobats performing acrobatic jumps through hoops stacked in a precarious balance above one another. A Chinese acrobatic specialty involving acrobats performing acrobatic jumps through hoops stacked in a precarious balance above one another. icaristAcrobat who juggle another acrobat with his feet. See Icarism, Risley Act. Acrobat who juggle another acrobat with his feet. See Icarism, Risley Act. iron jawAerial trick in which a performer hangs from a small apparatus fitting in his/her mouth (a ''mouthpiece'' &mdash; French: ''mâchoire'') and hooked to another apparatus or piece of equipment. Aerial trickAny specific exercise in a circus act. in which a performer hangs from a small apparatus fitting in his/her mouth (a mouthpieceSmall apparatus fitting in a performer's mouth, used to hang from another apparatus (see: Iron Jaw). — French: mâchoire(French) See: Mouthpiece.) and hooked to another apparatus or piece of equipment. jockeyClassic equestrian act in which the participants ride standing in various attitudes on a galoping horse, perform various jumps while on the horse, and from the ground to the horse, and perform classic horse-vaulting exercises. Classic equestrian act in which the participants ride standing in various attitudes on a galoping horse, perform various jumps while on the horse, and from the ground to the horse, and perform classic horse-vaulting exercises. king pole(English) The main pole of a circus tent, and the first one erected to pull up the others. (English) The main pole of a circus tent, and the first one erected to pull up the others. Koch semaphoreRotating apparatus originated in the 1940s by the Koch Sisters in Russia, used as a moving high wire. Rotating apparatus originated in the 1940s by the Koch Sisters in Russia, used as a moving high wireA tight, heavy metallic cable placed high above the ground, on which wire walkers do crossings and various acrobatic exercises. Not to be confused with a tight wire..
Korean cradleA swinging aerial cradle, attached to two verticals bars functioning like the ropes of a trapeze. It was originated by North Korean flying acts. A swinging aerial cradlePiece of apparatus (generally aerial) composed of two horizontal parallel bars in which a catcher locks his legs to be in position of catching a flyer. (Variant: Korean Cradle. ), attached to two verticals bars functioning like the ropes of a trapeze. It was originated by North Korean flying acts. liberty"Liberty act", "Horses at liberty": Unmounted horses presented from the center of the ring by an equestrian directing his charges with his voice, body movements, and signals from a ''chambrière'' (French), or long whip. "Liberty act", "Horses at liberty"Liberty act", "Horses at liberty": Unmounted horses presented from the center of the ring by an equestrian directing his charges with his voice, body movements, and signals from a ''chambrière'' (French), or long whip. ": Unmounted horses presented from the center of the ring by an equestrian directing his charges with his voice, body movements, and signals from a chambrière(French) Long whip customarily used by Equestrians for the presentation of horses "at liberty." (French), or long whip. longe(French, Russian) Safety line connected to a performer by a belt, going through a pulley, and held on the other end by an assistant, or a teacher. Also know as a ''mécanique'' (see this word). (French, Russian) Safety line connected to a performer by a belt, going through a pulley, and held on the other end by an assistant, or a teacher. Also know as a mécanique(French) A safety line, or "longe" (see this word), connected to a rotating arm equipped with a pulley and hanging above the ring, originally used for the practice of equestrian acrobatic acts (such as jockey acts). (see this word). lyraAerial apparatus similar to an Aerial Hoop, but in the form of a lyre, or an aerial hoop with a horizontal bar at its top. Aerial apparatus similar to an Aerial Hoop, but in the form of a lyre, or an aerial hoopA heavy metallic hoop used as a variance of trapeze, usually with contortion moves. (Also called Cerceau.) with a horizontal bar at its top. mécanique(French) A safety line, or "longe" (see this word), connected to a rotating arm equipped with a pulley and hanging above the ring, originally used for the practice of equestrian acrobatic acts (such as jockey acts). (French) A safety line, or "longe(French, Russian) Safety line connected to a performer by a belt, going through a pulley, and held on the other end by an assistant, or a teacher. Also know as a ''mécanique'' (see this word)." (see this word), connected to a rotating arm equipped with a pulley and hanging above the ring, originally used for the practice of equestrian acrobatic acts (such as jockeyClassic equestrian act in which the participants ride standing in various attitudes on a galoping horse, perform various jumps while on the horse, and from the ground to the horse, and perform classic horse-vaulting exercises. acts). Monsieur Loyal(French) The régisseur or presenter of the show in a French circus. So called because of the many members of the Loyal family who occupied this position brilliantly in Parisian circuses. (French) The régisseur(French) The stage (or ring) manager&mdash;and sometimes Ringmaster&mdash;in a French circus. (See also: Monsieur Loyal) or presenter of the show in a French circus. So called because of the many members of the Loyal family who occupied this position brilliantly in Parisian circuses. mouthpieceSmall apparatus fitting in a performer's mouth, used to hang from another apparatus (see: Iron Jaw). Small apparatus fitting in a performer's mouth, used to hang from another apparatus (see: Iron Jaw). pancake throwIn juggling, a figure in which a juggling ring is thrown in a way that makes it flip over its own axis rather than spinning around it, much like a pancake on a pan. In juggling, a figure in which a juggling ring is thrown in a way that makes it flip over its own axis rather than spinning around it, much like a pancake on a pan. panneau(French) A flat, padded saddle used by ballerinas on horseback. (French) A flat, padded saddle used by ballerinas on horseback. pantomimeA circus play, not necessarily mute, with a dramatic story-line (a regular feature in 18th and 19th century circus performances). A circus play, not necessarily mute, with a dramatic story-line (a regular feature in 18th and 19th century circus performances). pedagogue(Russian, from the French) A teacher in a Russian circus school. (Russian, from the French) A teacher in a Russian circus school. perch-poleLong perch held vertically on a performer's shoulder or forehead, on the top of which an acrobat executes various balancing figures. Long perch held vertically on a performer's shoulder or forehead, on the top of which an acrobat executes various balancing figures. pirouette(French) A full rotation of the body in the vertical axle. Double pirouette: two rotations, etc. (French) A full rotation of the body in the vertical axle. Double pirouette(French) A full rotation of the body in the vertical axle. Double pirouette: two rotations, etc. : two rotations, etc. planche(French) Acrobatic figure in which one's body is held in a straight horizontal position. (French) Acrobatic figure in which one's body is held in a straight horizontal position. plange(American, From the French, ''planche'') Acrobatic figure in which one's body is held in a straight horizontal position. (American, From the French, planche(French) Acrobatic figure in which one's body is held in a straight horizontal position.) Acrobatic figure in which one's body is held in a straight horizontal position. producing clown(American) In the traditional American circus, the head of Clown Alley, who imagines and produces gags for the other clowns in the show. (American) In the traditional American circus, the head of Clown Alley, who imagines and produces gags for the other clowns in the show. quarterpole(American) A support pole placed midway between the main poles and the sidewall of a circus tent. (American) A support pole placed midway between the main poles and the sidewallThe canvas wall at the periphery of a circus tent. of a circus tent. regisseur(German, from the French: Régisseur) In Russia, the equivalent of a theatrical director in the circus. (German, from the French: Régisseur) In Russia, the equivalent of a theatrical director in the circus. requisit(German, Russian) All props needed for a Circus act; used internationally mostly for props needed for a cage act, such as stools, etc. (German, Russian) All props needed for a Circus act; used internationally mostly for props needed for a cage act(English/American) Act performed in a cage, such as lion or tiger acts., such as stools, etc. rig(American) The rigged apparatus used to perform an aerial act, especially a flying act. (American) The rigged apparatus used to perform an aerial act, especially a flying actAny aerial act in which an acrobat is propelled in the air from one point to another..
ring curb(American. French: Banquette. Russian: Barrier) The circular barrier that defines the ring, and separates it from the audience. (American. French: Banquette. Russian: Barrier) The circular barrier(Russian. French: Banquette. U.S.: Ring Curb) The circular barrier that defines the ring, and separates it from the audience. that defines the ring, and separates it from the audience. ringmaster(American, English) The name given today to the old position of Equestrian Director, and by extension, to the presenter of the show. (American, English) The name given today to the old position of Equestrian Director, and by extension, to the presenter of the show. Feminine form of ringmaster(American, English) The name given today to the old position of Equestrian Director, and by extension, to the presenter of the show..
rola-bolaA board balancing on one or more cylinders piled on each other, and on which an acrobat stands performing juggling or acrobatic tricks. A board balancing on one or more cylinders piled on each other, and on which an acrobat stands performing juggling or acrobatic tricks. Roman rdingVarious equestrian exercises presented while riding standing on two horses, one foot on each. Various equestrian exercises presented while riding standing on two horses, one foot on each. Roman ringsA pair of small wooden or metallic rings hanging from ropes or straps, used by circus aerialists as well as competition gymnasts. A pair of small wooden or metallic rings hanging from ropes or straps, used by circus aerialists as well as competition gymnasts. roue Cyr(French) A large metallic hoop used like a German Wheel, developed by the Canadian acrobat Daniel Cyr. (French) A large metallic hoop used like a German Wheel, developed by the Canadian acrobat Daniel Cyr. Russian barreFlexible pole, held horizontally by two catchers, or under-standers, with which they propelled a flyer in acrobatic figures from and to the pole. Flexible pole, held horizontally by two catchers, or under-standers, with which they propelled a flyerAn acrobat that is propelled in the air, either in a flying act, or in an acrobatic act (i.e. teeterboard). in acrobatic figures from and to the pole. Russian swingGiant swing used to propel flyers into acrobatic figures onto the shoulders of a catcher, on a crash mat, or into a net. Giant swing used to propel flyers into acrobatic figures onto the shoulders of a catcherIn an acrobatic or a flying act, the person whose role is to catch acrobats that have been propelled in the air., on a crash mat, or into a net. short-distance(Flying Trapeze) A flying act in which the catcher is in a static cradle, limiting the swing motion to the flyer only. Generally performed on a standing apparatus, above a safety mat. (Flying Trapeze) A flying actAny aerial act in which an acrobat is propelled in the air from one point to another. in which the catcherIn an acrobatic or a flying act, the person whose role is to catch acrobats that have been propelled in the air. is in a static cradlePiece of apparatus (generally aerial) composed of two horizontal parallel bars in which a catcher locks his legs to be in position of catching a flyer. (Variant: Korean Cradle. ), limiting the swing motion to the flyerAn acrobat that is propelled in the air, either in a flying act, or in an acrobatic act (i.e. teeterboard). only. Generally performed on a standing apparatus, above a safety mat. sidewallThe canvas wall at the periphery of a circus tent. 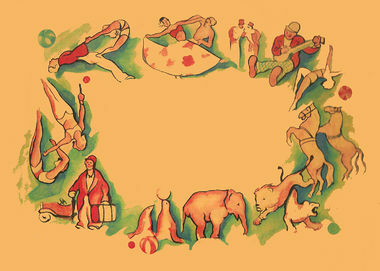 The canvas wall at the periphery of a circus tent. slack wireA Tight Wire, or Low Wire, kept slack, and generally used for juggling or balancing tricks. A Tight Wire, or Low Wire, kept slack, and generally used for juggling or balancing tricks. spanish webA vertical rope, or corde lisse, covered with fabric. A vertical rope, or corde lisse(French) A vertical rope used in aerial acts, either for the act itself, or to climb up to an apparatus. Called Spanish Web when covered with fabric., covered with fabric(See: Tissu). strap actAerial act performed hanging from a pair of fabric or leather straps. See Aerial Straps. Aerial act performed hanging from a pair of fabric(See: Tissu) or leather straps. See Aerial Straps. swaypoleA high, flexible vertical pole (originally made of a single piece of wood, and today of fiberglass) atop of which an acrobat performs various balancing tricks. A high, flexible vertical pole (originally made of a single piece of wood, and today of fiberglass) atop of which an acrobat performs various balancing tricks. teeterboardA seesaw made of wood, or fiberglass poles tied together, which is used to propel acrobats in the air. A seesaw made of wood, or fiberglass poles tied together, which is used to propel acrobats in the air. thrill actA spectacular act that focuses on the display of danger, whether real or staged. A spectacular act that focuses on the display of danger, whether real or staged. top mounterIn an acrobatic or balancing act, the performer who holds the top position (on a human column, for instance). In an acrobatic or balancing act, the performer who holds the top position (on a human column, for instance). trickAny specific exercise in a circus act. Any specific exercise in a circus act. trinkaA small, especially designed pedestal on which foot jugglers and icarists lie down to perform their act. A small, especially designed pedestal on which foot jugglers and icarists lie down to perform their act. under-standerIn an acrobatic act, the person who is at the base, supporting other acrobats (for example, the base of a human pyramid). Also known as the "bottom Man" (or "Bottom Woman"). In an acrobatic act, the person who is at the base, supporting other acrobats (for example, the base of a human pyramid). Also known as the "bottom Man" (or "Bottom Woman"). varieté(German, from the French: ''variété'') A German variety show whose acts are mostly circus acts, performed in a cabaret atmosphere. Very popular in Germany before WWII, Varieté shows have experienced a renaissance since the 1980s. (German, from the French: variété) A German variety show whose acts are mostly circus acts, performed in a cabaret atmosphere. Very popular in Germany before WWII, Varieté shows have experienced a renaissance since the 1980s. Washington trapeze(orig. : "trapèze à la Washington" – French) A heavy trapeze with a flat bar, on which an aerialist performs balancing tricks. Originated by the American aerialist H. R. Keyes Washington (1838-1882). (orig. : "trapèze à la Washington" – French) A heavy trapeze with a flat bar, on which an aerialistAny acrobat working above the ring on an aerial equipment such as trapeze, Roman Rings, Spanish web, etc. performs balancing tricks. Originated by the American aerialistAny acrobat working above the ring on an aerial equipment such as trapeze, Roman Rings, Spanish web, etc. H. R. Keyes Washington (1838-1882).